A 40-year-old South Carolina attorney has been sentenced to six months in prison for defrauding her sorority sisters of money meant to furnish a new house. 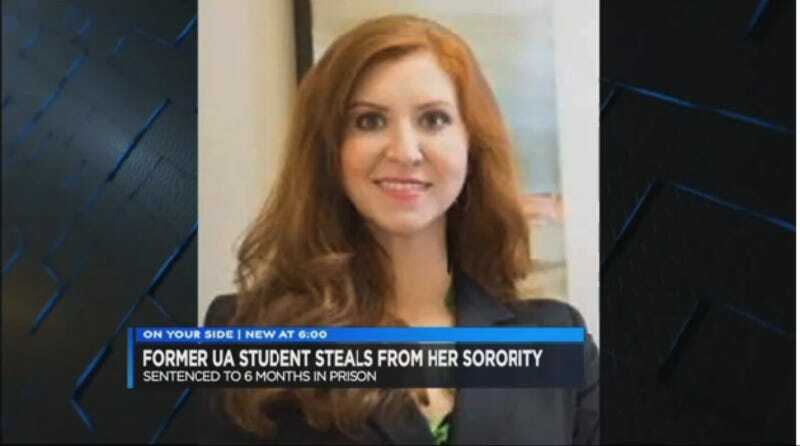 Jennifer Elizabeth Meehan was convicted in July of defrauding the Gamma Phi Beta Sorority at the University of Alabama. Meehan testified that while she admittedly had $235,000 in cash hidden in her closet, she intended to put that money in a scholarship fund. In September and November of 2014, Meehan submitted fraudulent furniture invoices totaling about $375,000 to Greek Resource Services, a contract company that handles the finances for fraternities and sororities at UA. GRS drew money from Gamma Phi Beta’s account at Bank of Tuscaloosa and gave Meehan two checks totaling about $375,000. She deposited that money into the newly opened First Citizens account, authorities said. Meehan wired money from that account into her personal business account at Bank of America for her personal use, according to her plea agreement. Meehan told the judge that she never intended to “abscond” with the sorority’s money, did not use it for personal gain, and shouldn’t have kept the money in a shoe box. “I wasn’t thinking as an attorney but like a ... sorority girl,” she said. Estes found that explanation hard to believe in his sentencing memorandum and at Tuesday’s hearing. “The idea that the defendant has all along had the $234,648.00, but only chose to turn it over on April 4, 2016, some nine months after her arrest is not credible,” he wrote. Meehan pleaded guilty in July to one count of bank fraud; she may also lose her license to practice law, which is currently suspended in both Tennessee and South Carolina. Records show she was previously reprimanded in 2012 for submitting a fake resume to a potential employer. Meehan told the judge she’d lost all her sorority friends, which is pretty understandable. Correction: This post has been updated to clarify that Meehan’s law license is currently suspended, but not revoked. A final ruling from the South Carolina Office of Disciplinary Counsel is pending.